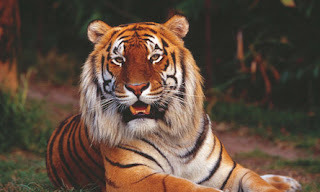 On the other side of the world, there is a place North Americans are likely unfamiliar with: it's called Tiger Island. Tiger Island is home to six Bengal and eight Sumatran tigers. Sultan, in the pic at the left, is the largest cat on tiger island weighing 441 pounds. He was born October 28, 1998. Tiger Island cats aren't confined to cages (though they're not tame); they're hand raised and play, swim, and wrestle with their handlers on a daily basis. This incredible place, located between The Gold Coast and Brisbane in Australia, offers visitors a one-of a kind and unique tiger experience. If you're ever lucky enough to go down under to visit Tiger Island, you'll be able to see tiger presentations (where you will learn all about these amazing animals), have a photo taken with a real tiger, and watch tigers walk through the park with their handlers (where you can both talk to the handlers and pet the tigers).